Spring is around the corner and I know many of you are looking forward to the beautiful weather and days spent outdoors. But before you start planning all your get-togethers and parties, remember that springtime also means an organized and revamped home. Stick To Your New Years Resolution To Be A Better You! Spring-cleaning is a great way to do a thorough cleaning and see the things you’ve accumulated over the past year. You may be surprised at just how much clutter you’ve collected over the last year. Why not “Hip Chick” your closet and make room for a brand new wardrobe? You can use spring-cleaning as an opportunity to do many things such as donating unwanted or unused stuff as well as cleaning and organizing your home. One way to do this is to go through your closet and get rid of all your outdated and unworn clothing. You can also reinvent your wardrobe by digging through your closet for items you forgot you even had. Remember to recycle all paper and plastic items. It’s good for the environment and good for the planet! You can even recycle electronics too! A Closet Fit For A Queen…Or A Hip Chick! 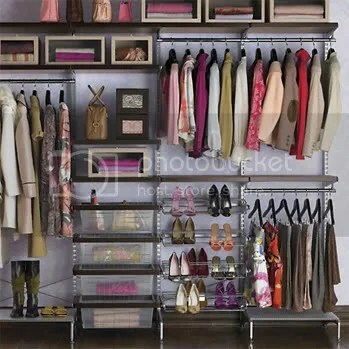 Another tip when organizing a closet is t o organize by color and season. It will make your closet look clean and orderly. Box away all those winter sweaters and bring out the tanks and shorts! If you know you won’t be able to complete all your cleaning at once, make sure you at least complete one or two tasks so you’ll still feel the accomplishment. 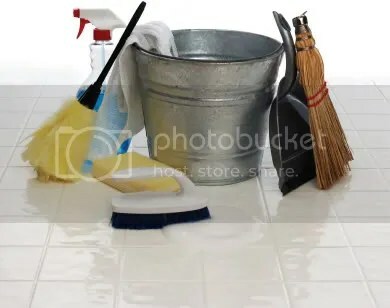 If you keep your spring-cleaning supplies at hand you will make the time go by much faster, otherwise you will find yourself stopping to look for the tools you need to complete your cleaning project. Have easy access to these cleaning essentials to make your cleaning go smoothly and easily. Also, make sure to use a basket or bucket to hold all your cleaning supplies. This makes your cleaning toolkit easily portable as you move from room to room. Spring-cleaning can be lots of fun if you make it that way! Put on your favorite radio station or CD to get your body moving. Move to the beat and sing as you clean. You’ll be making the time you spend cleaning fly by that much faster and you’ll even burn some calories as you clean! Statistics show that your body actually burns around 112 calories from just 30 minutes of mopping alone! With a workout like that you can feel a little less guilty next time you skip the gym. Tip# 1 Always start your cleaning from top to bottom so you don’t do double the work. Tip# 2 You don’t want to overwhelm yourself so make sure to take a break when needed. Tip# 3 Do one room at a time or a room a day. Tip# 5 Try to de-clutter a room by removing at least one or two items from the room. So remember – be positive and productive! All of your hard work will pay off in the end and you will have a cleaner home for your family and guests to enjoy. As you can see if you have a plan and stick to it, you spring-cleaning will be a breeze! Previous Post A Mardi Gras Celebration Without the Trip!